It may be called “stock car racing,” but the racecars running in today’s NASCAR Sprint Cup Series are anything but stock. They may look a little like their production namesakes, but that’s where the similarity ends. Whether the make and model represented is a Dodge Charger, Ford Fusion, Toyota Camry, or—like Regan Smith’s no. 78 Furniture Row Racing/CSX Play It Safe car—a Chevrolet Impala, these cars are “spec” cars, built to NASCAR specifications, and virtually identical, the only differences being slight variations in the body shape, and of course, engines. Front grilles and headlights? Tail lights? They’re just decals. First, a little NASCAR history (adapted from Wikipedia). When the series was formed in 1949 under the name Strictly Stock, the cars were production vehicles with no modifications allowed. The term “stock car” implied that the vehicles were unmodified street cars. 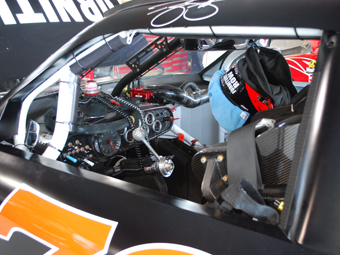 To prevent broken glass from getting on the race track, windows would be rolled down, external lights would be removed or taped over, and sideview mirrors would be removed. Eventually, the racecars in what became NASCAR’s Grand National Series (today’s Sprint Cup Series) evolved into factory cars that were modified and prepped just for racing. Before the mid-1960s, NASCAR racecars were typically based on full-sized cars such as the Chevrolet Bel Air, Pontiac Catalina, and Ford Galaxie. Beginning in 1966, mid-size cars such as the Ford Fairlane and Plymouth Belvedere were adopted and soon became the norm. NASCAR once enforced a homologation rule that at various times stated that at least 500 cars had to be produced, or as many as one car for every make’s dealership in the nation had to be sold to the general public, to allow a car to be raced. Eventually, cars were made expressly for NASCAR competition, including the Ford Torino Talladega, which had an extended, sloped nose, and the Dodge Charger Daytona and Plymouth Superbird, which had a rear wing raised above roof level and a shark-shaped nose cap that enabled speeds of over 220 mph. Beginning in 1970, NASCAR rewrote the rules to effectively outlaw such aerodynamic devices. In 1971, NASCAR phased in a rule to lower the maximum engine displacement from 429 cubic inches (7.0 liters) to its present 358 cubic inches (5.8 liters). NASCAR handicapped the larger engines with a carburetor restrictor plate. The transition was not complete until 1974. The downsizing of American cars in the late 1970s presented a challenge for NASCAR. Rules mandated a minimum wheelbase of 115 inches, but after 1979, none of the models approved for competition met the standard, as mid-sized cars now typically had wheelbases between 105 and 108 inches. After retaining the older models (1977 for the GM makes and 1979 for Ford and Dodge) through 1980, for the 1981 season the wheelbase requirement was reduced to 110 inches, which the newer model cars could be stretched to meet without affecting their appearance. 1987 marked an incredible but then unfortunate milestone for Sprint Cup cars. The incredible happened during Winston 500 qualifying when Bill Elliott established a world stock-car record when he posted an average lap speed of 212.809 mph. Then the unfortunate happened during the 22nd lap of the race when driver Bobby Allison blew an engine, which caused a flat tire in the middle of Talladega Superspeedway’s tri-oval. Allison’s car hit the catch fence and tore a long hole in it. Several spectators were injured. 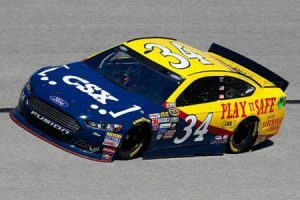 In the aftermath of the crash, NASCAR mandated the use of a restrictor plate at Talladega Superspeedway and Daytona International Speedway to reduce speeds. By 1989, GM had switched its mid-sized models to V6 engines and front-wheel-drive, but the NASCAR racecars only kept the body shape, using it with the existing V8 rear-wheel-drive running gear and chassis, rendering obsolete the “stock” nature of the cars. While the manufacturers and models of automobiles used in racing were named for production cars, the similarities between Sprint Cup cars and actual production cars were limited to a small amount of shaping of the nose and grill areas, and headlight and tail light decals. Until 2003, the hood, roof, and decklid were required to be identical to their stock counterparts. In 2007, NASCAR introduced a radically new vehicle specification known as the Car of Tomorrow (CoT). The design of this car focused on cost control, parity, and driver safety. The car’s width was increased by four inches, the bumpers were re-designed to render bump-and-run tactics less effective, and the height of the car was increased by two inches to accommodate taller drivers and increase aerodynamic drag. The driver’s seat was moved closer to the center of the car. The most noticeable changes were the addition of a rear wing replacing the familiar spoiler, and an adjustable front splitter, secured with braces. The wings could be adjusted between 0 and 16 degrees and were used with multiple configurations of end plates. 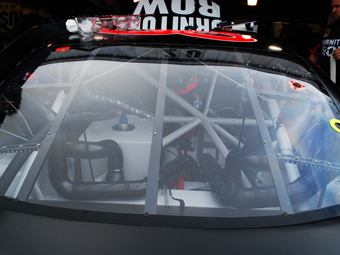 NASCAR requires all CoTs to conform to common body templates, regardless of make and model. The rear wing remained a controversial feature for several years. It was accused of forcing cars to become airborne in high-speed spins. In 2010 NASCAR decided to replace the wing with the traditional spoiler. 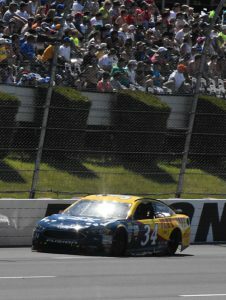 For 2011, NASCAR altered the nose of the car once more, with the splitter being reduced in size, and the braces being replaced by a solid front valence. Sprint Cup Series cars adhere to a front engine, rear-wheel-drive design. A roll cage serves as a space frame chassis and is covered by a 24-gauge sheet metal body with a closed cockpit. The only aerodynamic components on the vehicles are the front splitter, rear spoiler, NACA ducts in the windows only, and side skirts. (A NACA duct, also sometimes called a NACA scoop or NACA inlet, is a common form of low-drag air inlet design, originally developed by the U.S. National Advisory Committee for Aeronautics, or NACA, the precursor to NASA.) The use of rear diffusers, vortex generators, canards, wheel well vents, hood vents, and undertrays is prohibited. Fielding a car for one season usually costs $10 million to $20 million. 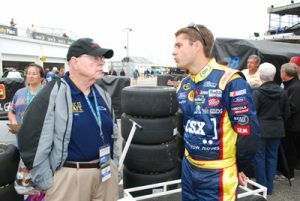 Each team may build its own cars and engines (per NASCAR specifications) or purchase cars and engines from other teams. ECR (Earnhardt-Childress Racing) supplies the engines for Regan Smith’s no.78 Furniture Row Racing/CSX Play It Safe Chevrolet. The cars are powered by a traditional overhead-valve V8 engine, with a cast iron block and a pushrod valvetrain actuating two valves per cylinder, and limited to 358 cubic inches (5.8 liters) displacement. Modern technology has allowed power output near 850 hp in unrestricted form while retaining the conventional basic engine design. 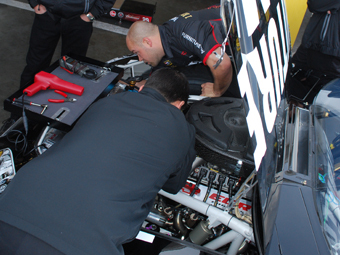 NASCAR changed from four-barrel carburetion to electronic throttle-body fuel injection with the 2012 season. The front suspension is a double wishbone design with power recirculating ball steering, while the rear suspension is a two-link live axle design utilizing trailing arms. Brake rotors must be made of magnetic cast iron or steel and may not exceed 12.72 inches diameter. The electronic systems remain rudimentary—no traction control, no anti-lock brakes, and many other devices to enhance vehicle performance, though with fuel injection there is a computerized engine managememnt system. A car’s chassis “setup” is a complex combination of caster/camber/toe adjustments, coil spring and shock absorber rates, tire compound and air pressure, track bar settings, and other mechanical factors. 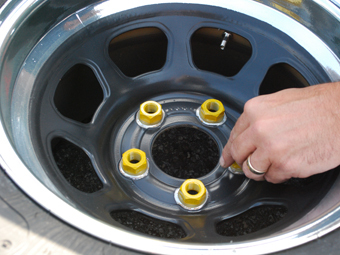 Minor adjustments, which can make a major difference in how the car handles, can be made during a pit stop. For example, a half-pound change in tire pressure on one side can mean the difference between a car that is “tight” (meaning it understeers and is difficult to turn) or “loose” (it oversteers and the rear end wants to break loose, causing the car to spin out). Chassis: Steel tube frame with safety roll cage, must meet NASCAR standards. Engine Displacement/Configuration: 5.86 L (5,860 cc) (358 CID) overhead-valve, 90-degree pushrod V8, two valves per cylinder. Weight: 3,200 pounds (without driver, fuel); 3,400 pounds (with driver, fuel). Power Output: 865 hp unrestricted; 445 hp with restrictor plate (Daytona and Talladega only). Fuel: E15 (15% ethanol) high-octane racing gasoline provided by Sunoco. Fuel Capacity: 17.75 U.S. gallons, most tracks. 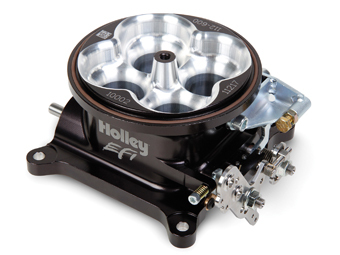 Fuel Delivery: Electronic throttle-body fuel injection. Aspiration: Naturally aspirated (no turbocharger or supercharger). Tires: Slick tire provided by Goodyear. Safety equipment: HANS (Head And Neck System) device, six- or optional seven-point seat belt. “I Brake For Trains” microsite sponsored by PTMW, Inc. (www.ptmw.com).